You may have a wardrobe full of handbags – each with a different purpose – but we bet you use the same one to carry your things to work, and it probably looks a bit tired. So if you’re looking to spring clean your collection and invest in a new bag for business, it’s important to find one you really like that will hold up when you inevitably fill it full of unnecessary items that you will probably never ever use (but like to have). Yes, choosing an attractive bag is important, as we all want to look good, but make sure you factor in the practical features that will make your bag fit for purpose. How do you commute to work and how long is the journey? This will impact on the style of bag you choose. If you have a long commute choosing a roomy bag with wide straps, or even a backpack style may be the most practical choice. There are some really professional-looking backpacks available that are perfect if you cycle or take the train to work. They’re big enough to fit small laptops and other essentials, and will distribute the weight so your arm doesn’t fall off before you reach the office. However, if you drive to work or are lucky enough to not have one hell of a commute, then you have a bit more freedom in terms of style. Tote bags and bucket bags are great for fitting lots of stuff in, but you might want to look for one with adjustable or detachable straps for comfort. If you carry a laptop to work, then choosing a work bag with a dedicated laptop compartment will make sure your device is protected, and that it is sturdy enough to endure the weight. Just make sure you check the product details and double check the bag fits your laptop size before you fall in love with the design. But if you use your phone or a small tablet for on-the-go working and entertainment during your journey, and like to travel light, you could even consider an oversized shoulder bag. We’ve picked out some of the best women’s work bags on the market, to cater to all lifestyles. Take a look at our list of practical and stylish bags that are guaranteed to make you look and feel the part. Just landed that promotion? Then if you’re thinking of treating yourself, this luxury women’s work bag could be just the thing you need to really help you get into your new role. This Saint Laurent handbag is both sleek in looks and more versatile than it seems. Carrying a bag on your forearm can get tiring, but this tote bag has a detachable shoulder strap so you can wear it as a cross body bag on those days when your arm needs a rest. Inside there’s also a removable zip pouch which makes for a nice place to keep your valuable items so you don’t lose your keys in the abyss of the larger main compartment. Pricey, but you can expect excellent quality leather that will serve you well in your business wardrobe. If you’re looking for something a little different to your standard black women’s work bags, then this Burberry shoulder bag makes for a stylish alternative. The deep mahogany colour combined with the woven checked detailing on the sides adds a touch of unique style to this handbag while still remaining profession, so if you like to play around with your work wardrobe and be a little adventurous, this bag might make the perfect statement piece to complete your look. The shoulder strap makes this more of a messenger bag, so even if you cycle to work, you can do so in designer gear! If you’re looking to switch up your look for spring, Kate Spade’s Atlantic Avenue Libby leather bucket bag is a great choice as you can use it for work and play. The pale blue grained leather would look as good with a grey suit as it would with a jeans and t-shirt combo. While the bag isn’t the right shape for a laptop, it can easily swallow a mini tablet, phone, purse and the hundred other things you need, thanks to its bucket shape. The only downside of this shape is that the top remains a little open, which may not be the best if you commute on a packed train, leaving you vulnerable to pickpocketing. However, it does have an internal pocket in the suede lining and magnetic closure for easy access. The bag is so versatile it will soon become a firm favourite. If you’re in the market for a seriously impressive bag, Saint Laurent’s Loulou Monogram extra-large quilted leather shoulder bag will certainly do the trick. The shoulder bag is a large version of the brand’s iconic smaller handbags, but more practical for work. Handmade in butter-soft leather, the Loulou handbag is detailed with the brand’s signature polished hardware, and pristine topstitching resulting in a refined quilted finish. The oversized and slouchy silhouette contains a multi-compartment interior, making it ideal for dividing personal bits and pieces such as a makeup bag from the kit you use for work. It’s possible to squeeze a small Macbook or iPad inside a compartment, while there’s a zipped compartment for keeping money and keys. The bag is fitted with an adjustable strap to suit your style, so you can wear it as a longer shoulder bag or with the chain doubled up so it fits neatly under your arm. Of course, such a large, luxurious bag comes at a price, but if you want to treat yourself, this handbag may be the one. A black tote is a wardrobe staple and adds gravitas to workwear, whether you wear a suit or can dress more creatively for work. Mulberry’s Bayswater grained leather tote bag has been a classic for years, thanks to its durable material and timeless shape. It’s got a spacious suede-lined interior and the twist-lock closure is practical for keeping items inside from falling out and is a hallmark of Mulberry, adding some designer cache to your handbag. It has comfortable top handles, enabling you to carry heavier items such as a small laptop, but doing so regularly could alter the shape of the bag and put strain on your shoulder. It also comes with a removable internal pouch to keep your bits and pieces safe. Thanks to its design and the quality materials used in its construction, you will have it for years to come. Carrying around such a large handbag can sometimes make you feel like Mary Poppins, so if you’re looking for something a little more compact, this women’s work bag by Aspinal of London is small but surprisingly spacious for using day-to-day. The bag has a click close function and has a smart, contrasting monochrome colourway that gives off distinct vintage vibes. The bag remains functional with a shoulder strap, which adds a contemporary twist to this handbag and could make ideal for commuting in style every day, and the durability of its saffiano-finish leather. 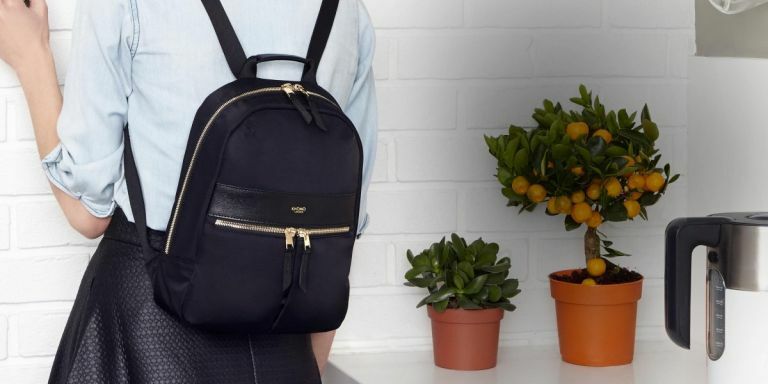 If a handbag isn’t really your style, then you can still keep both feminine and professional with this luxury backpack which would be handy for those who commute by train or bike. It has a laptop sleeve which can hold laptops or MacBooks up to 14 inch, and the pockets have RFID protection so you can have peace of mind your wallet is safe when on the go. The compartments are padded so you can expect your devices to be well protected, and the minimalist design won’t look out of place when you’ve got your business suit on. The classic tote bag is often favoured by the working woman as it's large so you can fit lots of stuff in it. The Regent Tote is a simplistic design that does its job well. It as a linked zipper pouch which could be used as a purse, and its large main compartment looks big enough to fit a small laptop or tablet. The only downside is it doesn’t have any kind of close mechanism, so your belongings may feel a little exposed, but if you drive to work or only have a short walk, this could be the perfect bag for you to quickly chuck all your essentials in with ease. If you don’t like the idea of all your belongings swimming around in one large compartment, then you can get organised with the Coach Leather shoulder bag. It has 3 compartments which make it easy to separate your belongings, including a middle zipped compartment for items such as your phone, keys and purse. The design of this bag is a little more relaxed, with a “Slouchy” construction as Selfridges has called it, which means it could easily double up as a women’s work bag and a casual bag for evenings and weekends. This Moshi Urbana briefcase is a little different in designed compared to the other women’s work bags on our list, so if you like to stand out from the crowd; this could be the bag for you. It’s got a slim body and can accommodate laptops up to 15 inch as well as documents, books or other devices such as tablets. The shoulder strap is designed with comfort in mind, which is great for those with long commutes, and we think the beige design has a real hipster vibe to it, which may not be for everyone, but it’s a practical women’s work bag nonetheless. If you love the look of the Saint Laurent handbag in our top spot but don’t have the cash to splash, then this Kurt Geiger handbag features a similar design which looks just as professional. It’s a large tote bag that has a cross body strap for when you want to go hands free, and unlike the Saint Laurent, it comes in a wide variety of colours which you can choose to match your personal style. It may look big, but if you’re looking to put your laptop in it we think it might be a bit of a squeeze. However, if you want a stylish women’s work bag for the New Year, you can really dress to impress with this one. When travelling for work you need a bag that is both durable yet still professional, and this Radley tote bag offers a casual style that we think is perfect for longer commutes and travel. The soft fabric means it’s comfortable to carry and the material is water resistant for when you’re on the go. It’s quite large, so you can expect to be able to fit all your belongings in it, and it has a pocket that is suitable for laptops and tablets. Unlike some of the other women’s work bags, this one zips up completely so you can have peace of mind your belongings are secure. If you often go away on business trips, this bag could be useful for packing everything you need.